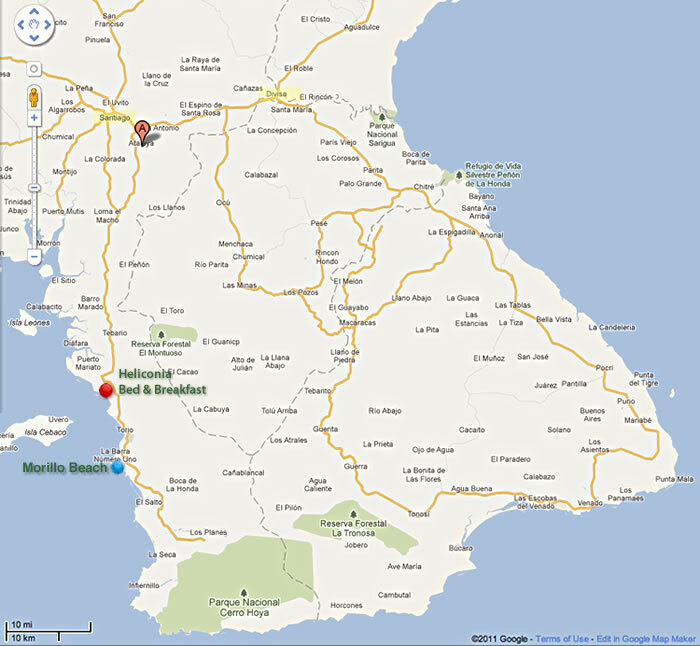 Driving west: After passing La Devisa stay alert. After ~ 1o km you will pass the Black Lion restaurant to your left. 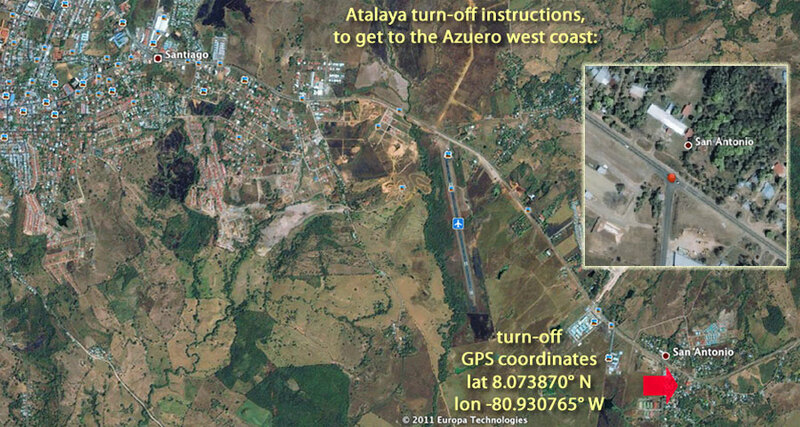 2 km further you will see a green sign ATALAYA. Turn south here. Driving from Santiago east: You will pass the airstrip and shortly after the hospital to your right. Watch out for police with radar guns around the hospital and observe speed limit! Turn south at green ATALAYA sign. Turn right after the gas station, follow the PLAYAS sign. Fill up here, the next gas is 75 km and sometimes out of fuel. The scenic road south of Torio curves along the coast through cattle pastures, and steep hills providing stunning vistas of the coastline, passing deserted beaches, some of them only accessible by dirt roads. High clearance 4×4 vehicles are required for off-road explorations. 5 miles south of Torio has been discovered by the surfing crowd a couple of years ago and is becoming a popular surf spot in Panama with a consistant break. An annual surf tournament is held here in February. Cabañas & a hotel are under development. Driving between Torio and Arenas bring back memories of California’s Highway 1 around Big Sur – minus the fog, and no pine trees here. The area is sparsely settled, but you will see plenty of cows, – some of them love to hang out on the road. So drive carefully, especially around curves. If you see oncoming cars flash their lights it means slow down – livestock ahead! The village of Arenas hosts occasional rodeos on weekends, which draws tons of locals and can be a lot of fun to watch. The road ends at the village of Flores, gateway for hiking and birdwatching tours into Cerro Hoya National Park. Kees & Loes at Heliconia B&B, phone # 6676.0220 will be happy to arrange guided hikes into the park. Sun and clouds mixed. High 94F. Winds SSW at 10 to 15 mph. Some clouds in the morning will give way to mainly sunny skies for the afternoon. High 93F. NE winds shifting to SSW at 10 to 15 mph. Partial cloudiness early, with scattered showers and thunderstorms in the afternoon. High 91F. E winds shifting to SSW at 10 to 15 mph. Chance of rain 50%. Partly cloudy early. Scattered thunderstorms developing in the afternoon. High 91F. ENE winds shifting to SW at 10 to 15 mph. Chance of rain 60%.